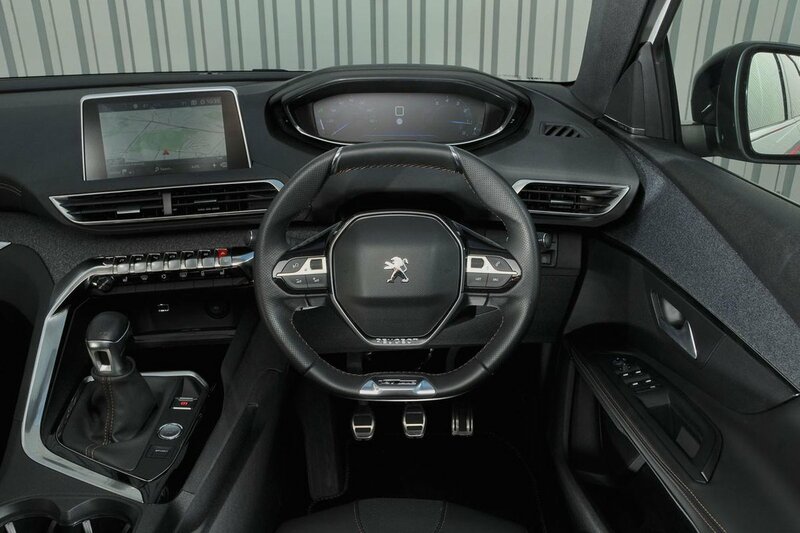 Peugeot 5008 Interior, Sat Nav, Dashboard | What Car? 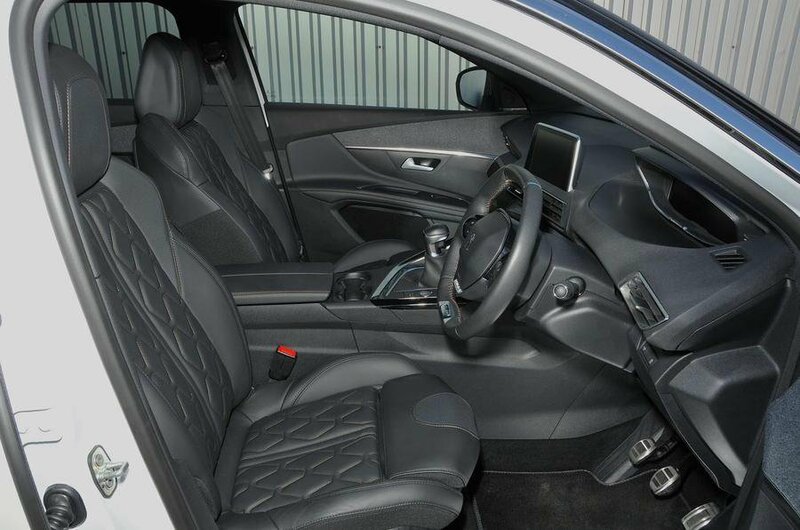 All versions come with a height-adjustable driver’s seat and a reach and rake-adjustable steering wheel. Thy provide enough tailoring to get comfortable, and our recommended mid-spec Allure trim adds manually adjustable lumbar support to improve things yet further. If you fancy a powered driver's seat then you need to go for the bells-and-whistles top GT trim. Otherwise it’s part of a pricey option pack that brings with it the luxury of a massaging function, which is something of a rarity in this class. Peugeot’s i-Cockpit dashboard is designed in such a way that you the instruments are viewed above, rather than through, a steering wheel which is far smaller than in most cars. In some other Peugeot models, such as the 308, the steering wheel can block your view of the instruments, but this issue doesn't plague the 5008: after a little familiarisation it feels quite natural and works very well. You also get digital instruments instead of analogue dials, displayed on a 12.3in screen. They’re very clear and you can configure the display in a number of ways to show the information most useful to you, which can include a large map to display your navigation route. Most of the controls are sensibly positioned, but we have a few gripes: you have to go into the touchscreen menus to operate climate control functions such as changing the temperature, and the cruise control buttons are completely hidden behind the steering wheel. While you can train yourself to find the cruise control buttons by touch alone, having to navigate through screens just to change the temperature is a faff. Seeing out of the 5008 is about as easy as it gets in a modern SUV. You sit high and, even though the front pillars are quite thick, you still get a great view forward. Looking behind, your over-the-shoulder view is great because of the large rear quarter windows. If you still fret that a car of this size will prove a headache to park, then go for our recommended Allure trim for front and rear parking sensors and a reversing camera as standard. Should you want even more peace of mind, a 360deg camera system is available that shows you a bird’s eye view of the car as you’re manoeuvring. And that’s not all the electronic trickery the 5008 has to offer. All versions come with dusk-sensing lights and rain-sensing wipers, and GT Line trim includes the bright LED headlights that are optional on the Allure. The 5008’s infotainment system is a pretty sophisticated piece of kit. All versions come with a DAB radio, Bluetooth and Apple CarPlay and Android Auto smartphone mirroring. That last feature means you can display and use selected apps from your phone on the 8.0in screen, including Waze and Google Maps. However, if you choose our preferred Allure trim, you get inbuilt sat-nav with live TomTom traffic updates as standard. The touchscreen is positioned sensibly high up on the dashboard. It's presented in reasonable definition and has decent graphics, but it doesn’t look nearly as good as the crystal-clear displays you'll find on the latest Volkswagen Group cars – the Skoda Kodiaq included. It's not quite as easy to use, either. Problems arise when you use the sub-menus, where some of the smaller icons are tricky to hit on the move and there’s often a delay while the system processes your commands. Some functions are also a job to reach through the convoluted menus. One thing that’s worth considering if you enjoy your music is an upgrade to the Focal premium sound system. This adds a 515W amplifier and more speakers that are also of a higher quality, plus a subwoofer. It sounds punchy and really rather good. 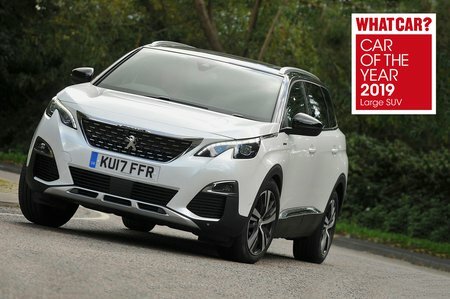 While certain cars in its class, such as the Kodiaq, are a little more solidly built, only those with premium badges and the price tags to match can match the 5008's upmarket feel. Most of the interior surfaces are soft to touch and those that aren’t tend to be hidden low down. There’s an eclectic mix of materials that work harmoniously to enhance the ambience, including chrome highlights around the centre console and, depending on which trim you opt for, attractive cloth or wood inserts across the dashboard and on the doors. At night, the interior is bathed in a subtle glow from the all-round ambient lighting. It looks truly special and makes the 5008 an enjoyable place to while away a long journey.